Working with multiple monitors can really boost productivity, but it also presents a number of unique challenges. For example, not everyone likes to have the same wallpaper on all monitors, or even the same screensaver. Some people also use different wallpapers or themes to color-code their desktops. DisplayFusion Pro ($25, 30-day free trial) lets you assign per-monitor wallpapers and screensavers, but that’s just the beginning. 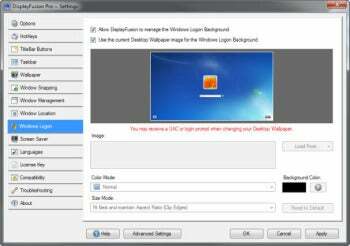 DisplayFusion Pro even lets you change the background of the Windows Logon screen. DisplayFusion’s rich configuration interface can be used to assign hotkeys to numerous window management operations, such as moving windows around, spanning a window across all monitors, and even locking the mouse cursor to the current monitor or window. You can also assign any of these actions to a “TitleBar Button”--a small button that DisplayFusion overlays on the active window, next to the Minimize, Maximize, and Close buttons Windows provides. When my girlfriend started using multiple monitors last month, she was surprised to discover that the Windows taskbar doesn’t span monitors, but it shows only on the primary monitor. DisplayFusion Pro can correct this by adding a taskbar to each “extra” monitor. The extra taskbar looks just like the native Windows one, but has a different context menu. You can have it show icons only for windows on that monitor, or for all currently running applications. If you move your “real” taskbar to a different edge of the screen, DisplayFusion automatically moves the extra taskbar to the corresponding edge on its own monitor, so all screens always look alike. DisplayFusion Pro’s wallpaper management tools are powerful enough to warrant their own configuration interface, separate from the main Settings dialog. They rival John’s Wallpaper Switcher, which is saying something. You can set different wallpaper for each monitor, or span a single image across all monitors. DisplayFusion can show a random image out of a collection stored on a local hard drive, but it can also grab images from Flickr and VladStudio. It has a dedicated interface for each of these websites; for example, the Flicker interface lets you specify search keywords and specific Flickr groups you’d like to poll for images. If you’re bored with the default Windows Logon screen background, DisplayFusion lets you easily change it. You can use the same background as your current wallpaper, but if you’re using DisplayFusion to randomly switch wallpapers at a set interval, this may not be a good idea: DisplayFusion has to pop up a UAC prompt every time it wants to change the Logon screen background. The popular free version of DisplayFusion doesn't do per-monitor taskbars--the main selling point of the Pro app--and has a less comprehensive set of hotkeys. It can't modify the Windows logon background, either. However, the two programs use the same installer. If you're using the free version, you can activate the Pro trial by filling out a form and requesting a trial key.